Government of Karnataka, Revenue Department invites applications for recruitment of Village Accountants for filing up 130 Vacancies. Eligible candidates apply online from 10th November 2014 to 09th December 2014. Educational Qualifications: 12th Class passed in CBSE / ICSE or equivalent. How To Apply: Eligible candidates apply online through official website on or before 09/12/2014. It’s direct recruitment process. On the basis of merit in PUC examination your application will be selected. For complete details refer the official notification. diploma completed students are eligible for this or not sir….???? Educational Qualification is PUC or 10+2; If you have higher than this, you can also apply. But only the PUC/ 10+2 marks will considered for these posts. Not required to send any documents now. Once your online application (supporting with the respective fee payment) is shortlisted, you will be asked to produce the original documents to the recruitment cell. 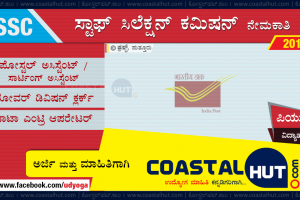 Upon the satisfactory verification of the supporting documents, your selection will be finalized for Mysore VA Recruitment.